Check out how many calories in Chocolate Banana Bread. Get answers to all your nutrition facts questions at FitClick. Description: Baked bread with chocolate chips and bananas. Tip: For nutritional information on all the ingredients in Chocolate Banana Bread just click on each ingredient name. Then adjust the serving size for any Chocolate Banana Bread ingredient with the serving size tool in the nutrition facts area to the right to see how you can save calories, carbs and more. Using an electric mixer, combine eggs, bananas and vanilla in a large mixing bowl. Add sugar, salt, baking soda, cocoa powder and flour and mix thoroughly. Pour batter into a greased 9"x5" loaf pan. 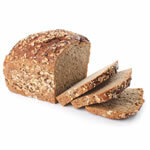 Bake 55 to 60 minutes or until toothpick comes out clean when inserted in center of bread. Remove from pan and cool before serving. Find more recipes like Chocolate Banana Bread. FitClick has over 60,000 foods and recipes with detailed nutrition information to view.